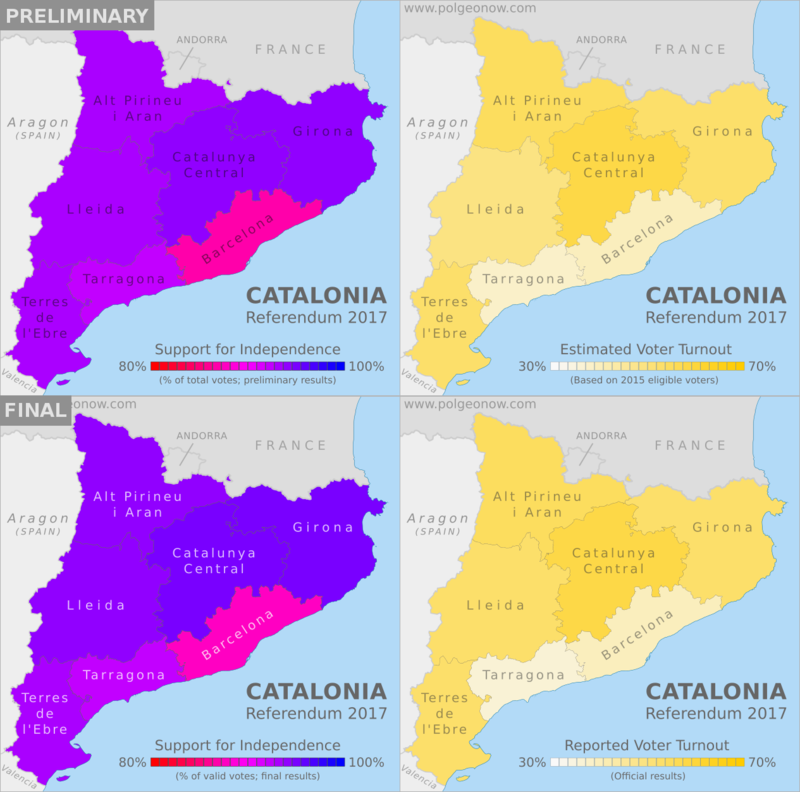 These maps, originally published two days ago based on preliminary results and estimates of voter turnout, have now been updated with the final data from the Catalan government. The final results showed no change in support for independence significant enough to effect our map. 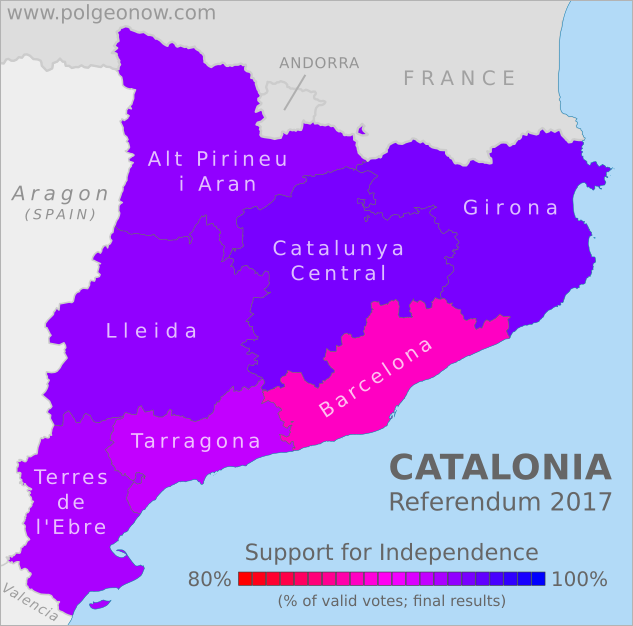 However, we decided to re-do the map using the Catalan government's official method of calculating the percentage, which excludes spoiled ballots from the total votes (the original map included these so-called "null votes" in the total votes when calculating the percentage of YES votes). This method results in slightly higher figures for all regions. We also changed the color of the region labels, because they were hurting our eyes. The voter turnout map, originally based on estimates of eligible voters drawn from 2015 election data, has also been updated with official figures. 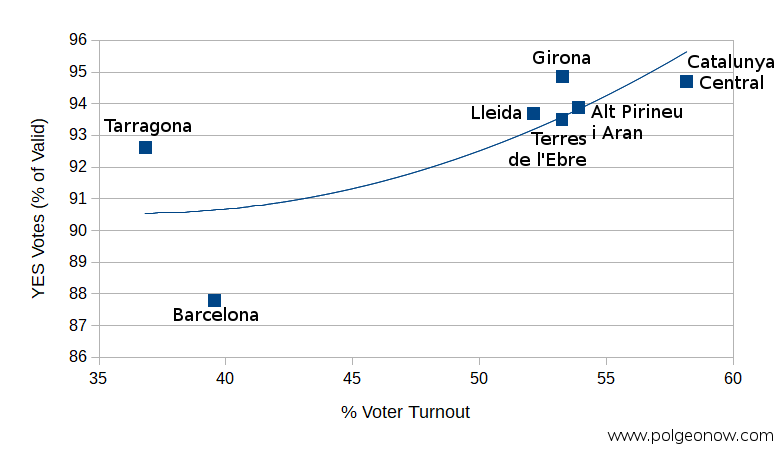 The only two changes: Tarragona had a slightly lower voter turnout rate than we estimated, and Lleida had a somewhat higher turnout than our estimate. Click here to compare the original maps with the new versions. Support for independence among those managed to vote was very high, with 90% of valid votes and 89% of total ballots cast. This is unlikely to represent the actual proportion of the Catalan population that supports independence, since polls earlier this year showed the region split roughly half and half over the question. On the other hand, about three-quarters of Catalans supported the idea of at least voting on it, and after the Spanish government's heavy-handed crackdown, it's likely that independence has only gotten more popular. As seen on the left-hand map above, independence received the highest percentage of votes in Girona and the rural Catalunya Central - the referendum passed by nearly 95% in both areas. Meanwhile, in Barcelona, Catalonia's capital and largest city, support was significantly lower, but still reached about 88% among those who voted. Barcelona is a large, diverse city, and many residents may be immigrants from other parts of Spain who don't buy into the idea of Catalonia as a separate country. How many people showed up to vote? The Catalan government's official voter turnout figures have been a matter of some controversy, since the referendum was carried out without access to the official Spanish voter rolls, amid police attempts to confiscate the regional government's own records. 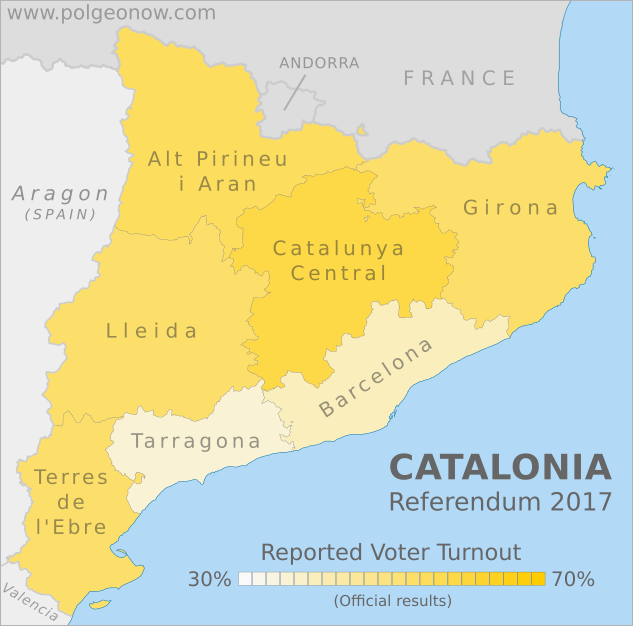 In addition, to avoid the police crackdown on polling stations, residents were encouraged to vote anywhere in Catalonia that they could, even though they would normally have to go to a polling station in the municipality where they were registered. This resulted in some municipalities' total ballot counts being higher than their actual population of eligible voters - fueling accusations of fraud by the referendum's opponents. But that doesn't stop us from doing an analysis of the claimed data. As seen on the right-hand map above, turnout was highest in Catalunya Central, and lowest in Tarragona and Barcelona - the same two regions that had the lowest support for independence. And in fact, when we graphed out voter turnout versus YES votes, there does appear to be a correlation: In general, the higher voter turnout was in a given region, the more people there voted for independence (and vice versa). Maybe this should be no surprise: It's likely that many opponents of Catalan independence didn't feel motivated to defy the Spanish government by voting. After all, the police were taking the opponents' side by trying to shut down the vote and prevent independence. So you might indeed expect that people in pro-independence places would have come out to vote in bigger numbers, while people in less separatist areas would stay home. Interestingly though, the less-separatist, low-turnout Barcelona region also had by far the highest rate of blank votes. Some 33,000 people, or 2.3% of participating voters in the metro area, didn't write anything on their ballots - that's compared to 1.2% to 1.6% for other areas. Given the major police efforts to block people in Barcelona from voting, it's hard to imagine that truly unenthusiastic voters would have made it to the ballot boxes. But these blank votes could represent people who wanted defy the police crackdown by voting out of principle, even if they were undecided about actual independence. Want to see the picture in more detail? Check out our new article with municipality-level results maps for the Catalan referendum!